Butter pecan is one of my favorite ice cream flavors, though I don’t seem have it nearly as often as I have classic vanilla. As the name suggests, the ice cream is rich with the flavors of butter, roasted pecans and vanilla – and they come together amazingly well. 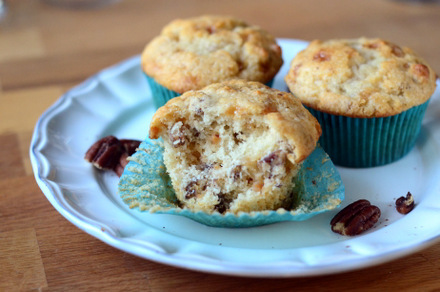 These flavors can be used in other baked goods, such as cookies and these Butter Pecan Muffins, to make them just as delicious as the ice cream that inspired them. The muffins are made with browned butter (which you can make in just a few minutes using these instructions), plenty of roasted pecans and toffee bits. While the butter used in butter pecan ice cream isn’t typically browned, browning it gives the butter a nutty, caramelized flavor that really compliments the flavor of the pecans. It also allows the flavor of the butter to stand out more than it ordinarily would, allowing you to use less butter overall. 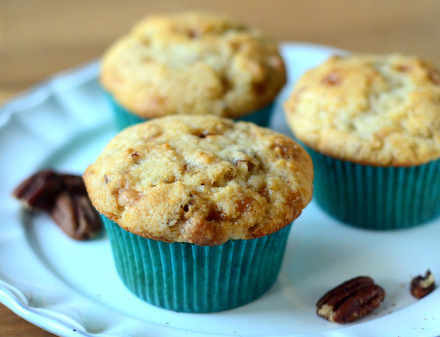 The toffee bits add a nice extra hint of sweetness to the muffins, while the pecans add texture, as well as flavor. As is often done with butter pecan ice cream, I finely chopped the nuts to ensure that there would be some in every bite. The finished muffins are absolutely addictive. They’re moist and tender, with the same wonderful combination of butter, pecans and vanilla that you get in every bite of the popular ice cream flavor. The muffins should be allowed to cool before serving and need no accompaniment besides a cup of hot coffee. They should keep well in an airtight container for a couple of days after baking and can also be wrapped and frozen if you want to keep them on hand for any butter pecan cravings that might pop up. In a small saucepan, cook the butter over medium heat until it is golden brown and takes on a nutty aroma, about 3-4 minutes. Transfer to a bowl and allow to cool for at least 5 minutes before using. In a large bowl, whisk together flour, sugar, baking powder and salt until well-combined. Make a well in the center of the flour mixture and add in the egg, milk and vanilla extract. Whisk liquid ingredients until smooth, then stir in to the rest of the batter. Pour browned butter, pecans and toffee chips into the rest of the ingredients and stir in until butter is completely incorporated and the pecans are well-distributed. Divide batter evenly into the prepared muffin cups. Bake for 18-20 minutes, until muffins are lightly browned and a toothpick inserted into the center comes out clean or with only a few moist crumbs attached. 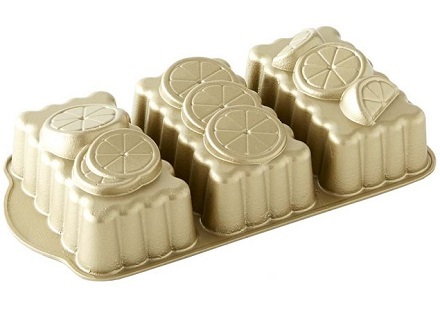 Remove muffins from pan and allow to cool completely on a wire rack before serving.